Nothing satisfies like your favourite meat dish. No matter your meat preference, knowing your cuts will help you to choose the right piece of meat for every meal every time. Cut out the confusion and get a real taste for beef, lamb, and pork cuts with our comprehensive guides. Pork is the most commonly consumed meat across the globe, eaten both freshly cooked and preserved. Known for its versatility, pork can be used from nose-to-tail to prepare a variety of dishes. 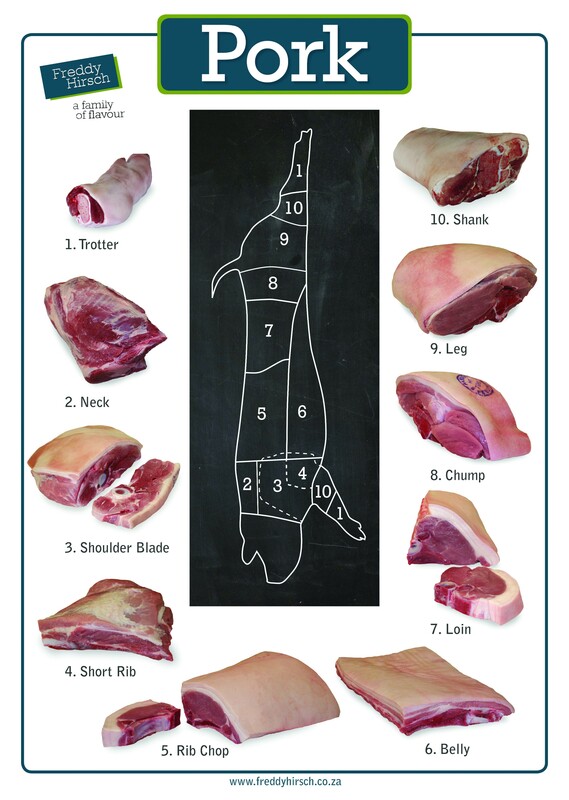 Take a look at our guide to pork cuts, then get inspired with our pork recipes. Trotter: While trotters may not seem instantly appetising, the meat is tender, soft and flavourful. Cooking them is time-intensive, but the results are worth it. Neck: The neck produces delicious meat which should be slow-cooked to allow intramuscular fat to melt. This keeps the meat moist and tender. Pork shoulder cuts can be roasted, diced, or minced. Shoulder blade: The meat from the shoulder blade is a highly versatile cut. It can either be minced or diced for cooking slowly in stews, or kept on the bone and slow-roasted until tender. The fillet from the top of the shoulder is just tender enough to be cut into steaks for grilling. Short rib: Inexpensive and full of flavour, spare ribs can be grilled, barbecued, roasted, or slow-cooked. They’re usually sold as a whole rack, or cut into individual, trimmed ribs. Add chopped spare ribs to stocks and stews to add flavour. Rib chop: Rib chops work particularly well with sage and apple. Marinate your chops for extra flavour or try a dry rub. They are best cooked in a pan, on a grill, or on the braai. Use a high heat and turn the meat regularly for juicy, succulent results. Belly: A fatty, but tender cut of meat, the belly is delicious when slow-roasted. It’s also used to make streaky bacon. Pork belly is high in fat, which makes it a tasty and versatile cut. It can be cooked slowly at a low temperature for soft meat that melts in the mouth, or sliced and crisped in a hot pan. Loin: Pork loin is a classic roasting joint, delicious as part of a traditional Sunday roast with apple sauce. Loin can either be cooked in one piece with the bone, or deboned, stuffed and rolled up to make an exceptionally juicy roast. Chump: A really meaty chop cut from the rump of the pig, chump can be bought either on or off the bone. Chump is a cheap cut with delicious flavour and texture. It’s versatile and easy to cook, either fried, grilled or on the braai. Leg: Leg is usually roasted whole, but it can also be boned and cut into smaller roasting joints, or thinly sliced to make steaks. Pork legs are low in fat and can be quite dry when slow-roasted. Cooking the meat on the bone will help to keep it moist and produce lovely juices that you can use for gravy. Shank: Generally prepared by slow pot roasting or oven roasting to retain its tenderness, shank is a cost-efficient cut. It is usually cut from the lower area of the front leg, and is also known as the ‘foreshank’. When used in a pot of beans or braised, smoked shanks will produce meat that will be fork tender, moist, and full of flavour.